Central bankers used novel monetary policies (QE, Operation Twist) to force interest rates below “market-based” levels so that commercial banks can access artificially-cheap funds to lend to governments (by buying government securities) at artificially-low rates. In the middle, savers that wish to act prudently by compiling a nest-egg see their plans thwarted by punishingly-low deposit or money-market rates. Central bankers & many economic advisers insist that policies that depress interest rates will “stimulate” the economy by making it cheaper for businesses to borrow are being disingenuous. But banks find that the costs associated with lending to private-sector actors (e.g., hiring personnel to carry out due diligence, risk of default, evaluating value of collateral, etc) are higher than buying “risk less” government bonds. Rewarding government profligacy while punishing thrift can only exacerbate economics imbalances while encouraging/allowing the accumulation of excessive public-sector debt. 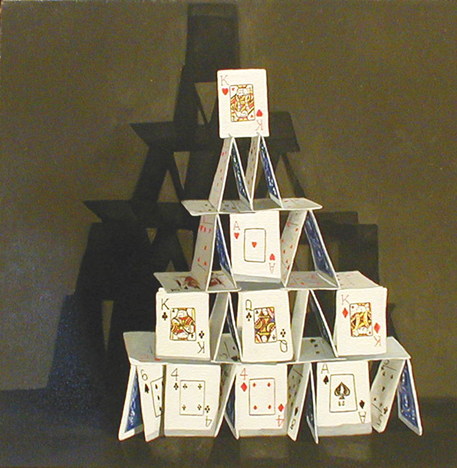 The house of cards is becoming increasingly unstable. Were interest rates to rise to what would be a historically-low rate of, say 3%, servicing costs of government debt would force either a massive decrease in spending, a massive increase in taxation or default.